Kenwood TS-440SAT transceiver - Tested working with dummy load and my HT for RX. I removed the adhesive that goes bad inside a couple years ago when the display had issues, and it has been working fine since then. W, M1 and M2 filters work, no N filter. Antenna tuner installed. PS-430 PSU had two bad large caps when I bought the unit about 5 years ago, so I replaced those and it has also been working well since. 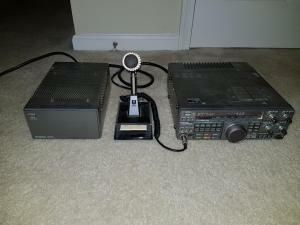 Asking $400 for the transceiver alone, $50 for the mic or PSU, or $450 for the whole set if picked up or delivered in the greater Washington, DC (or possibly Albany, NY) area. Will consider shipping if the buyer pays.